Includes a digital archive of U.S. Supreme Court historical materials spanning a 140 year period. Briefs and petitions from the 1978-79 term to the present. A few pre-1978 briefs are also available. Selected cert. petitions from 1978 to the present. A docket-number search is most accurate because parties' names can change while the case is pending. Selected coverage begins with 1930 (Briefs), 1985 (Petitions), & 1982 (Joint Appendices). GW Law users can access LexisNexis Academic remotely or at the Gelman Library to find Supreme Court briefs and petitions. You may search by keyword, party names, citation, counsel, brief type or appeal statement. Selected coverage begins in 1936, but all briefs are available for cases granted certiorari beginning after the 1993-94 term. Other briefs and appendices may be available back to January 1979. Law patrons have off-campus access only. Replaces LexisAcademic. Law patrons have off-campus access only. Merit and some amicus briefs in PDF from 2003 to current term. The ABA's Preview of Supreme Court cases gives background, issues and arguments in cases before the Court. Email alert is available. Selected briefs and petitions in review-granted cases. Full viewing access to Landmark Briefs and Arguments of the Supreme Court of the United States. Constitutional law. The "cases" section of the Oyez site includes selected briefs and petitions. Search for your case, or select the year and case name to see what briefs and petitions are available. All briefs (other than responses in In Forma Pauperis cases) filed by the Solicitor General from 1985- .
microfiche, 1897/98-current. Includes full opinion, summary disposition and certiorari denied cases. Use the Finding Aid shelved under blue "Microform Indexes" sign to locate early case records. Includes briefs for selected cases. (In-library use only.) HathiTrust provides full PDF download access to member institutions. Many briefs are only available at the Library of Congress. Check the Library of Congress U.S. Supreme Court Records and Briefs collection. Where the fiche collection indicates "All cases," denied petitions for certiorari should be included. See the Law Library of Congress' blog posts on the brief collection itself and the binding process. Most case files created prior to 1999 are maintained in paper format only. Paper case files may be stored at the courthouse or at one of the Federal Records Centers (FRCs). A case file may be obtained through the court or directly from the FRC. Contact the court in which the case was filed for more information. Search CourtListener.com's free database of millions of PACER documents. Coverage is from 1960 - present. "The joint appendix shall contain: (1) the relevant docket entries in all the courts below; (2) any relevant pleadings, jury instructions, findings, conclusions, or opinions; (3) the judgment, order, or decision under review; and (4) any other parts of the record that the parties particularly wish to bring to the Court's attention." 1980 - 1990: Former Supreme Court Rule 30 provided the requirements for the joint appendix. 1967 - 1980: Former Supreme Court Rule 36 provided for the first time the requirements for a single appendix produced as a joint effort of the parties. 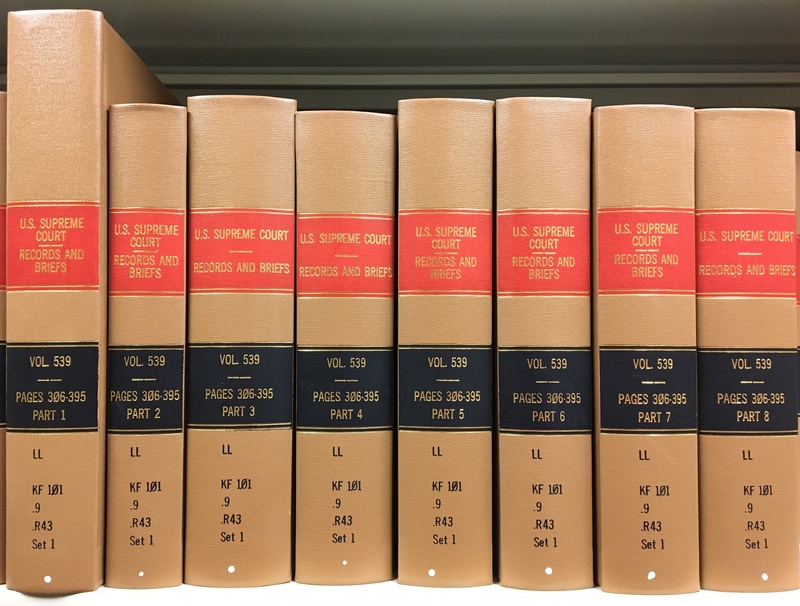 Contains four sections: United States Supreme Court, United States Circuit Courts of Appeals, State Final Appellate Courts, and State Intermediate Appellate Courts. Each section is arranged by court, with the address and phone number of the clerk of court before listing libraries that hold briefs from that court. Next are listed libraries in alphabetical order by location, giving the name, address, phone number, URL, holdings information, format of the holdings, and when possible, its lending policy.